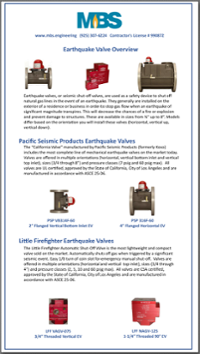 If you’ve been reading our blog, you already know about seismic shut-off valves. 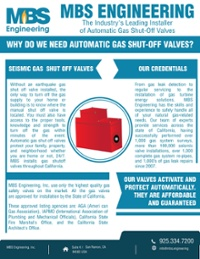 Designed for earthquakes, accidents and other events of impact, seismic shut-off valves like those installed by MBS are used as a safety device to shut off natural gas lines in the event of an earthquake. They generally are installed on the exterior of a residence or business in order to stop gas ﬂow when an earthquake of significant magnitude transpires. This will decrease the chances of a ﬁre or explosion and prevent damage to structures. And MBS Engineering, unlike your local utility company, can help you install these on your property. But whether you want to install seismic shut-off valves or you already have them, here’s a fact you may not know: these valves require regular clean outs. 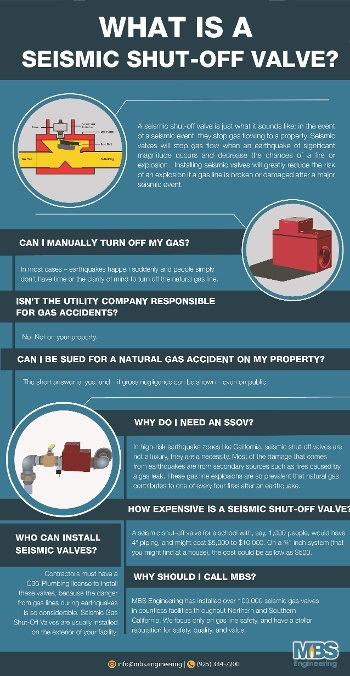 You should bring in a professional about every 6-12 months to inspect and clean any earthquake emergency gas shut off valves you have on your property. This will also help ensure they’re working properly. 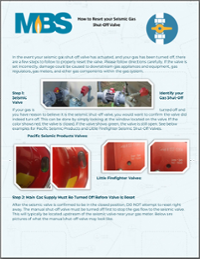 In addition to regular cleaning, seismic shut-off valves may need to be reset in order to function properly. If working correctly, this should only happen following an earthquake or another significant event that causes the valve to close as it was built to do. The professionals at MBS Engineering are happy to visit your property and reset the valve for you. And while we’re there, we can also check for anything amiss with your natural gas pipelines to ensure everything is as it should be following a major event. You can learn more about these services by contacting us.